1. 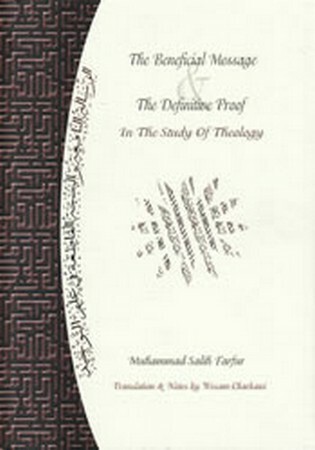 Kitab Sharh as-Awi 'Ala Jawhar at-Tawhid by Imam of jurisprudence (fiqh), scholar of scholars Ahmad ibn Muhammad al-Maliki as Sawi (1175-1241). 2. Al-Aqida al-Islamiyya completed in 1385 AH by Abdur Rahman Hasan Habannaka. 3. Minah ar-Rawd al-Azhar (Gift f Blossoming Garden - explanation of Imam Abdu Hanifa's Al-Fiqh al-Akbar) by Ali ibn Sultan Muhammad al-Qari (1014). 4. Al-Aqida al-Islamiyya by Mustafa al-Khin and Muhyiddin Misu . Differences between varying schools are also explored. The author, Shaykh Muhammad Salih Farfur (born in Damascus in 1901 and died 1986) was renowned for his piety, knowledge and diligence in the pursuit of educating others who sought knowledge. He founded the famously known institute in Syria known as Al-Fatih, graduating students by the thousands as well as a specific branch of the school for females. This text is currently taught in Al-Fatih Syria and other Islamic institutes world-wide. The format of this text is such that it presents the Arabic followed by its translation.